Most people can name at least a few bones of the human body, but not many know about the cytoskeleton within our cells, let alone the "microtubules" that give it its shape. Now, a group of Princeton researchers has resolved a long-standing controversy by identifying exactly how the body creates these micron-sized filaments. Using a novel imaging technique, Sabine Petry and the researchers in her lab were able to show that a protein called XMAP215, previously known only to help microtubules grow faster and longer, is necessary to creating the nucleus of each microtubule. Their work appears in the May issue of the journal Nature Cell Biology. "Our study shows that microtubules in the cell are generated through cooperation between two molecules," said Akanksha Thawani, a fourth-year graduate student in Petry's lab who is the first author of the new paper. "XMAP215 functions together with a larger protein complex that forms ring shaped structures, gamma-tubulin ring complex (g-TuRC)." "Microtubules are like the skeleton of the cell—they give the cell its architecture," said Petry, an assistant professor of molecular biology and the senior author on the paper. "Beyond that, by positioning organelles, they can also serve as a highway for other components. Motor proteins can actually 'walk' along these microtubules. They really are fundamental to cell biology." For 30 years, researchers in the field have known that the pillar-like microtubules are built of bricks called "tubulin" that grow from a tiny nucleus, and most agreed that g-tubulin was the only compound that could create that nucleus. But there was a problem, said Petry. The few researchers who had succeeded in isolating g-TuRC found that when they put it in a test tube, it spectacularly underperformed at creating microtubule nuclei. "Gamma-TuRC barely does anything," she said. "It nucleates a handful of microtubules, but it should make thousands." Researchers have been puzzling over this for years, looking for some other factor that could activate or enhance g-TuRC. That search may now be over. "The microtubule field has known [that g-tubulin] is not sufficient, and that other factors, that were not known, were also needed for full activity," said Eva Nogales, a professor of molecular and cell biology at the University of California-Berkeley who was not involved in this research. "The work by Petry and co-workers now shows that XMAP215, previously considered a microtubule 'polymerase' involved in microtubule elongation, acts synergistically with g-tubulin to promote efficient microtubule nucleation. The work provides an answer to this critical puzzle in our understanding of microtubule regulation in the cell." Complicating their research was the difficulty in seeing the tiny structures at all, explained Thawani, a graduate student in in chemical and biological engineering. "The cell has tens of thousands of these polymers at any time, and our standard ways of observing these under a microscope do not allow for a good resolution," she said. 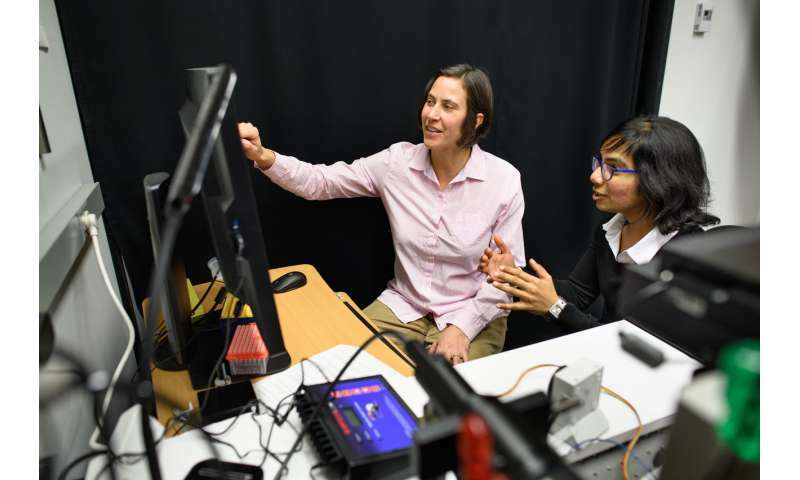 "With TIRF microscopy, we don't illuminate anything outside that layer," she explained. "We don't see it. That's why we get a much higher signal-to-noise ratio: We don't see the other stuff that otherwise overlaps with the observation. So instead of seeing the haystack, which is still on top of it, we can see the needles against the glass. ... We can actually see the microtubules being born, we can see them grow, we can see what happens to them—at the resolution of the needle." Thawani hadn't set out to solve the mystery of why g-TuRC underperformed in test tubes. 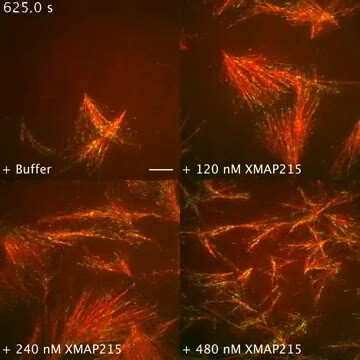 She had wanted to use TIRF microscopy to observe the growth of microtubules whose size she hoped to control with XMAP215, a protein known to encourage microtubule growth. But instead of just growing longer microtubules, she saw that she was growing many more of them. "We added this protein, and it totally created a blast of microtubules," Thawani said. "That was one of the most mind-blowing bits in the whole process." "The intention was just to study how these 'fireworks' form," said Petry. "So it was serendipity that Akanksha wanted to make them bigger, but then she saw—'Oh my gosh, there are more microtubules!' And the reason why she could see that more microtubules formed was that we have developed this imaging and extract capability. That's why no one else has seen it before." Their team showed that the same phenomenon was seen in a test tube where g-TuRC generated microtubules together with XMAP215. This was chiefly the contribution of Rachel Kadzik, a postdoctoral researcher in Petry's lab and a co-first-author on the paper who purified the g-TuRC and, with Thawani, purified the XMAP215. G-TuRC is a 44-protein complex that has proven very difficult to purify and study in the 30 years since it was discovered. Using the pure extractions of each protein, Petry's team was able to see that in a test tube, neither protein can nucleate microtubules without the other. "If we take XMAP215 out, not a single microtubule forms. If you take g-tubulin out, not a single microtubule forms," Petry said. Their discovery required the combination of Thawani and Kadzik's experiments, viewed with Petry's TIRF microscopy imaging technique. "It was interesting," Petry said. "Rachel came from developmental biology, down to chemistry, and then Akanksha came from engineering up to biochemistry, so together, they were the super-team." "XMAP215 is a microtubule nucleation factor that functions synergistically with the γ-tubulin ring complex" by Akanksha Thawani, Rachel Kadzik and Sabine Petry appears in the May issue of Nature Cell Biology. -It was Petry's dish ... ehm, lab et cetera, which is why she as senior is asked; and the paper is not in question from that anyway. And the two identified ingredients are sufficient. Why do you even try to pretend that you did not read the article yet want to comment on it? Read the article, *then* comment - but sensibly, plz.